Destination Blue Lagoon is the official transport partner of the Blue Lagoon and connects the world famous spa to both Reykjavík and Keflavik Airport. Transfers including hotel connections run many times every day, all year round, following seasonal opening hours of the Blue Lagoon. One way 2,750 ISK. Both ways 5,500 ISK. Destination Blue Lagoon is the official transfer partner for the Blue Lagoon connecting the Blue Lagoon to Reykjavik City and Keflavik International Airport. Destination Blue Lagoon shares a service desk with Airport Direct inside the arrivals hall of Keflavik International Airport. 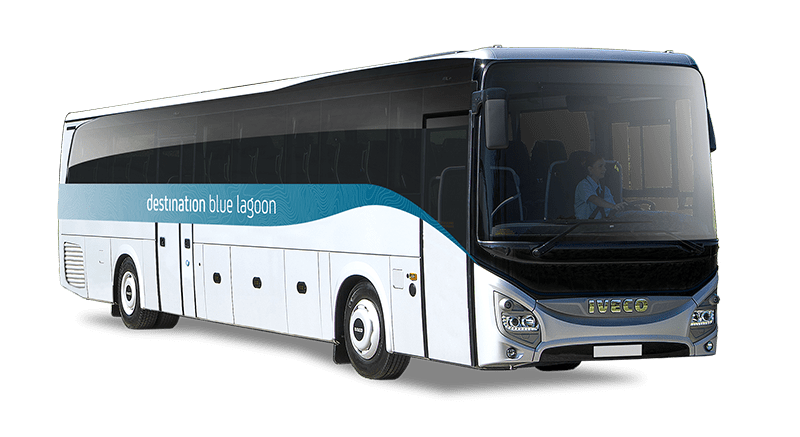 You need to have pre booked a ticket into the Blue Lagoon in order to book a Blue Lagoon transfer. Our buses are located right in front of the airport. Our service desk is open 24 hrs a day, every day of the year. The duration of your airport transfer from Keflavík International Airport to Blue Lagoon will take 20 minutes and after your visit to the spa your transfer to Reykjavik Terminal will take 40 minutes. SmartBus meets all arriving buses from the Blue Lagoon and drives you to your accommodation or nearest bus stop. All passengers from the Blue Lagoon change buses at Reykjavik Terminal and board a SmartBus. A SmartBus hotel connection is included in your booking and you will be dropped off at your accommodation or nearest bus stop after changing buses in Reykjavik Terminal. Drop off is operated by Smart Bus, a bright green bus. Departures from Reykjavik to Blue Lagoon starts with a hotel pick up from SmartBus and a short transfer to Reykjavik Terminal in central Reykjavik City All transfers to the Blue Lagoon from Reykjavik include a free SmartBus hotel pick up from your accommodation or nearest bus-stop. The duration from Reykjavik Terminal to the Blue Lagoon is 45 minutes. If you are travelling onwards to Keflavik International Airport your transfer time from the Blue Lagoon to the airport is 20 minutes. All departures to and from Reykjavik are from our Reykjavik Terminal located in Skógarhlíð 10, zip 105 Reykjavík. The Destination Blue Lagoon bus departs according to our schedule in connection with SmartBus hotel connections. Smart bus operates a hotel connection from all hotels and guesthouses in the central Reykjavík area. For more detailed information, please see the next tab, pick up information. The Hotel Connection for Destination Blue Lagoon is operated by SmartBus. SmartBus is a pick up and drop off service for Airport Direct, Destination Blue Lagoon and Reykjavík Sightseeing, operated on bright green buses. Instead of having multiple operators picking up passengers on different shuttles, we only use one per departure time, meaning a eco-friendlier pick up that minimises traffic in the city centre. SmartBus transfers you to Reykjavik Terminal where you will find your bus waiting for you, ready to take you to Blue Lagoon. To sum up, look for a bright green SmartBus if you booked a transfer with Destination Blue Lagoon. When booking your transfer online you will be able to select from a list of available pick up locations. With a Hotel Connection we pick you up from your hotel, guesthouse, or designated bus stop if you are staying in the restricted area in downtown Reykjavik. The reason behind the restricted area is that Reykjavik City aims to keep the small scaled city centre a pleasant and safe place for everyone with less bus traffic. Hence, the city of Reykjavik offers special pick up and drop off places. The bus stops are located in and around the city centre and are easily accessible. Most hotels in restricted area are within a 5-10 minute walking distance from bus stops. For help to see which pick up location is suitable for you, please contact us at info@airportdirect.is. Map of Reykjavík area with the Reykjavík City Bus Stops listed.